Sunset Carson (born Winifred Maurice Harrison in 1920) had a brief career in a string of B-westerns in the latter half of 1940's, produced by Republic Pictures. 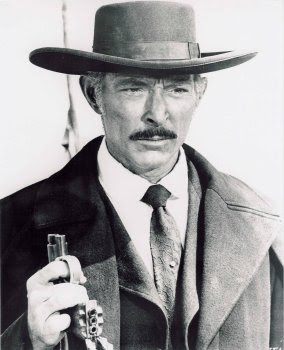 After having travelled the circuit as a trick shoot artist for so many years, in 1980 he was hired by a South Carolina public television station to host the series "Six Gun Heroes", in which he would introduce a B western from the 1930's or 40's. 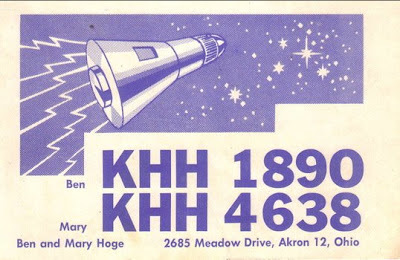 I caught the show circa 1983-4 when Erie PA's PBS affiliate WQLN used to broadcast it on Saturday nights at, if memory serves, 7:30 PM. which would be followed by "Q Classics" (featuring a twin-bill of classic movies which would be repeated the Sunday afternoon of the following weekend). In those days, I was still trying to convince my mother that the big TV set in the living room wouldn't screw up with such newfangled gadgets as converters or VCR's, so to see anything outside of channels 2 to 13, I would ascend the stairs to the little black-and-white TV with the rabbit ears in my room to watch the show at Channel 54 on the UHF dial. I've always loved westerns, but in this period, I was particularly ravenous for them. While early on the bar had been set for me with my adolescent viewings of For a Few Dollars More and Once Upon A Time in the West, in truth any oater, big or small would be a television event for me. CBC had periodically shown matinee westerns in the stream of RKO second features they would routinely show on Saturday mornings (those times are deserving of a post all their own), but I had not yet seen any B westerns of the "singing cowboy" variety (in which stars like Roy Rogers or Gene Autry would often play characters with their own names) until I began watching "Six Gun Heroes". Even at that young age, I was struck by how innocent these films were, as they were geared toward pre-teen boys, therefore people seldom died (or certainly not in a gratuitous fashion), and the only smooching going on would likely be with Trigger. Having already been introduced to spaghetti western nihilism at such an impressionable age, these movies appeared quaint even then, but I still appreciated their charm. 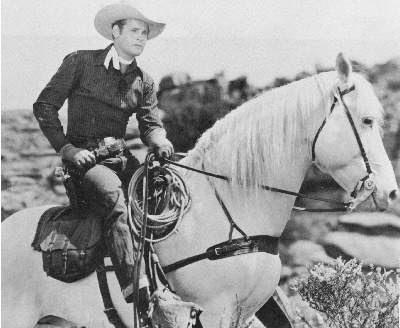 "Six Gun Heroes" ran for an hour, including Carson's wraparound segments. The films he presented usually clocked in at just under an hour on their own, so I am uncertain if the movies were trimmed to fit a broadcast schedule. 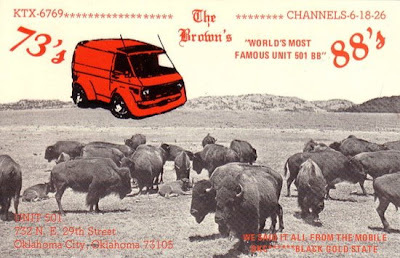 The titles I can remember seeing on the show include Springtime In the Rockies and Oh Susanna, both with Gene Autry (the former was the first B western I ever saw that used automobiles; the latter featured a memorable scene where Autry lip-synchs to a phonograph record in order to get out of prison); The Vigilantes of Boomtown, with Allan "Rocky" Lane as Red Ryder (co-starring little Bobby Blake, after "Our Gang" but way before "Baretta"); and His Brother's Ghost, in which Buster Crabbe's twin brother gets murdered, and therefore poses as his brother's ghost to fight the bad guys. (The latter synopsis should tell you how much of an open mind one needed to appreciate such films). I haven't watched any of these pictures in years-- it would be fun to relive their charms all over again. Just so long for a while." This musical interlude may have subconsciously played a role in my faithful viewing of the program, as the lyrics encapsulate the restless wayward spirit of my youth, and why I most remember this moment from "Six Gun Heroes". This spoke to the little cowboy in me, much as the original films must have done to their audience back in the glory days of the Saturday matinee. This weekend (after a week full of obituary notices) I was shocked to hear that author Bill Landis had passed away on December 23 from a heart attack, at only 49 years of age. Landis was a projectionist in the last glory days of New York's 42nd St. grindhouse era. Before this area was plowed over in favour of gentrification, these ancient theaters like the Rialto would unspool such sensational titles as Let Me Die a Woman, Bloodthirsty Butchers, and Farewell Uncle Tom, to name only a few. From 1980 to 1983, he published the influential fanzine Sleazoid Express, which not only documented the antics onscreen, but all of the rough trade and other deviant behaviour which went on amongst the seats. 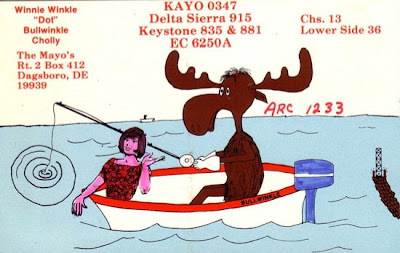 In later years, he and his wife Michelle Clifford had revised the namesake for a short run of zines which are still available on their website. And then they collaborated on a book, also entitled Sleazoid Express (seen above), with separate chapters devoted to such genres as roughies, mondo films, blaxploitation, et al, revolving around one of the crumbling moviehouses that specialized in such choice fare. In addition, Bill Landis also penned the superb biography, Anger, on Kenneth Anger, which similarly offers a visceral experience of the man's work, while deconstructing a lot of the myths that the filmmaker has created about himself. Landis' sporadic legacy is absolutely essential film writing, not only because he has documented material seldom covered in mainstream press (or least, covered without a sardonic irony), but his "gonzo" approach is unique to the field, eschewing, say, Andre Bazin for Lester Bangs or Hunter S. Thompson, where the circumstances surrounding the screening is integral to the celluloid being reviewed. Rather than offering homogeneous consumer guides, his style instead offers the reader a chance to live these worlds vicariously-- a cinematic approach to reviewing a visual medium. The grindhouse experience has of course been absorbed by the mainstream, much as "The Deuce" has been replaced by Disney... distilled for mass consumption, and becoming a pale imitation of its inspiration. Instead of Bad Girls Go To Hell, it's now Snakes on a Plane. And despite many postmodern writers' attempts to lionize the genuine films after having viewed them on such a displaced medium as home video, they too pale in comparison to the pen of Bill Landis, simply because the man has lived it all. His work is an important document of a piece of renegade cinema history that is a vital part of our popular culture. 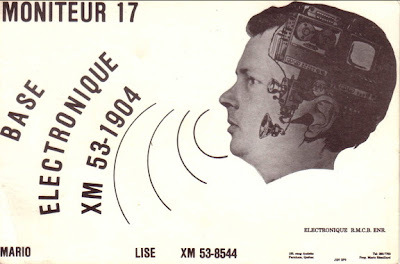 In the early fall, I had a telephone interview with Eddy Dobosiewicz, otherwise known as "Maxwell Truth", the front man of the long-running late-night movie show, Off Beat Cinema, whose good vibes are transmitted from Buffalo's ABC affiliate at WKBW-TV. 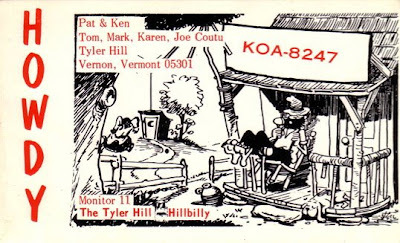 I had long been a fan of the show, which airs in our area Saturday night (or if you like, Sunday morning) at 2 AM. 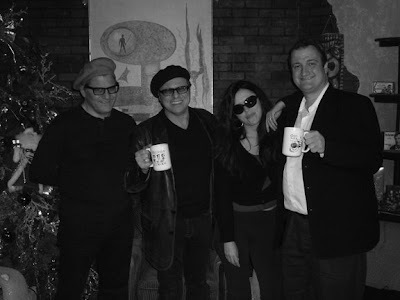 Each week, the hip beatniks named Maxwell Truth, Bird (Tony Billoni) and Zelda (Connie McEwen) introduce some way gone flick from their humble hang out The Hungry Ear Cafe, peppered with enough hip talk ("It's a mad pad, Dad") to keep an aging hepcat like me in vogue. While perhaps they're best known for showing such B-movie classics as Frankenstein Meets the Space Monster and House on Haunted Hill, the show also presents bona fide arthouse films like Breathless or The Third Man. But you don't just watch Off Beat Cinema to see a movie-- the discerning insomniac gets a whole package, including musical guests, comedy bits, trailers and shorts. Even their commercials (from regular sponsors like Curly's Bar and Grill) have a "beat" sensibility that reflects the show's ambiance. Since its debut in 1993, Off Beat Cinema has grown from an amusing curiosity into an institution, since it has been picked up in other markets in the United States. Its arrival couldn't have been more timely, as the late-night airwaves were inundated with infomercials and chat line ads. It has become the last bastion of the "late night movie" experience, those fabled times of yore, when there was a movie on after hours instead of generic plugs for salad spinners, usually introduced by a local celebrity or TV station personality. These shows became a night light and a veritable companion for the lonely souls who were still awake. It is a delight to see OBC still going strong after fifteen years. It has become a tradition in my house- many Saturday nights would have me coming home in the wee hours, and then hitting the remote to see "what's on the beatnik movie"- and now it likely has a new generation of followers who probably weren't even born when the late show was in abundance! Having seen OBC grow over the years (from when they used to have Mingus' "Pithecanthropus Erectus" as the theme song before David Kane and Them Jazzbeards gave the show its signature soundtrack), it had long been an ambition of mine to interview someone from the show, and never had I a better reason than for ESR's latest issue, the tribute to Late Night Television. Mr. Truth was a gracious interviewee, and as the conversation neared its close, we felt a kinship as both OBC and ESR were projects that people do secondarily-- the things we do out of love at the end of the day after we do what we must for money. At that moment, Eddy had said "We gotta get you on the show." True to his word, he followed up a couple of days later, with a message saying he was looking into some dates, and before long another message arrived, asking me how Nov. 13 was for me. The beatniks had done three segments on their own. When they were preparing, Bird borrowed one of the Santa Claus hats I brought (and wore it throughout the show), and Maxwell asked: "Where did THAT come from?" I responded: "Toronto". And then they had me on to do the interview, talking about the publication and about the late night viewing experience, which of course pertained to the new issue. The interview was shot twice. They had used the second take for broadcast, as I presume there was more coverage and better blocking, but in truth the first take was better, more alive, with overlapping dialogue and more spontaneous. In the second take, the questions and answers were the same albeit without the off-the-cuff feel of the first, which actually befits the milieu. Upon seeing the interview the night of the broadcast, I was disappointed that they didn't put my website address onscreen during the talk despite having had me write it down for them later, but I conceded that I didn't appear that terrible on camera despite that I was shot in profile (my worst camera side). And finally, for the end of the show, I did a bit where I have my Santa Claus hat on, and dole out presents for the beatniks. I had given each one of them copies of "The Roger Corman Scrapbook", since Corman figured so prominently on the show over the years. (In the master shot, you'll briefly see Susan reading.) They had yours truly signing off with their archetypal phrase "Keep Watching The Skies", and then we wrapped. After we finished the coffee and packed up, Maxwell invited us to see some music with them, and had I planned to stay over in Buffalo that night, I would gladly have done so. We left Buffalo, taking a bit of the show with us, and I don't simply mean the complimentary mugs, T-shirts and DVDs. It was also the feeling of having developed a kinship, as even the technicians responded to how ESR mirrors what OBC means for them-- something you do for love on the side. I have a feeling that, to paraphrase a familiar movie line, this could be the beginning of a beautiful friendship. In fifteen years, Offbeat Cinema has become somewhat of an institution that I hope reigns for years to come, and I would be remiss if I didn't extend our thanks to the cast and crew for allowing us to sharing a piece of it. 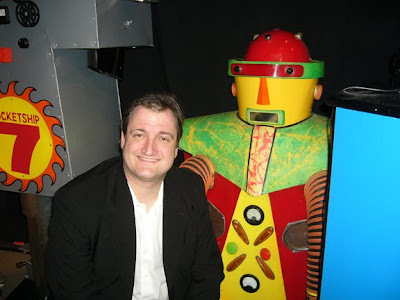 Yours truly and Promo The Robot from Rocketship 7. This guy got my vote for most creative display. 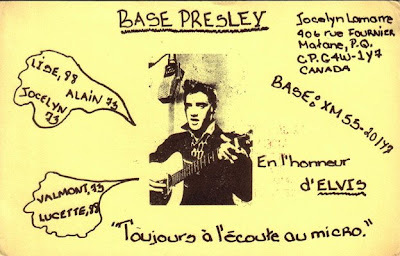 Twice in the past few years, I had signed up for Expozine in Montreal, and twice I had chickened out at the last minute. It had long been a desire of mine to attend this zine fair and spread the gospel of ESR at a new location, and partially what deterred me from going in the past were overhead costs and scheduling. But since they made the fair a two-day affair for this year (to accommodate the ever-growing number of presses), it was never a better opportunity to check the event out, and therefore I turned the excursion into a weekend-long trip. But I was also compelled to attend the show this time due to the disappointing sales I've had in 2008 at my regular venues. This could be attributed to people's frugality due to the economy or the sad notion that small press, while more prolific than ever, is dwindling from interest of the public eye, or simply, I need to find some new blood. And since it gets ever harder for me to promote and distribute ESR properly (without putting myself further in the hole), I felt that it was never a better time to expand my operation however possible. Even now, people ask me why I don't put my stuff in stores. The simple, if perhaps no less longwinded, response to that is: I started in the zine scene way too late. In 2001, the zine world was still thriving, as desktop publishing became more prevalent in homes, and the internet hadn't yet replaced a lot of the printed material. But in short order, a lot of consignment places like Towers, review publications like Factsheet Five, and independent distros, who all were instrumental in promoting awareness of zines, had closed up shop. In the following years, film publications even more professional, and obviously more widely known, than mine have closed up shop due to financial considerations. The greater the overhead, the greater the loss. I much prefer the direct approach, where I can communicate with my customers in person, on the road and at shows. As such, I value all the more any new comrades I pick up along the way. Case in point, this fall at Canzine, when Brian Random and I had tables together, we befriended writer-musician Robert Dayton, and found quick allies in Katie Durant, who was launching the first issue of her zine, "So Bad It's Good Movies", a refreshing, irony-free pub that I hope continues to grow. Two consecutive traveling companions had opted out of accompanying me to Quebec due to other commitments, and so I nervously made arrangements for myself. (I sheepishly admit that I have never been to Montreal before-- one of my greatest regrets is that I did not travel when I was younger and had more time and money to do so.) Since I had was up until the wee hours the previous couple of nights printing stock for the show, most of the train ride up on the Friday was spent sleeping, but was excited to have arrived at this unfamiliar location. My hotel (a rather no-frills, but homey establishment) was a fifteen minute walk from the fair, and despite the cold, we were blessed with sunny skies for both days, as I would leisurely explore the neighourhood on the way to and from. The architecture of my surroundings was awe-inspiring. 13 years ago, friends of mine would say that if I ever I went to Montreal, they would never get me out of there. They were 100 percent right. On the Sunday, it hurt to leave the funky bohemian location I had inhabited for two days. My hotel was right beside an excellent Vietnamese restaurant which I sampled on the Saturday night. And within a one-block radius, there were quatre depanneurs for those last-minute beer runs. Since I had more time to kill on Saturday evening, I explored the immediate neighbourhood. Perhaps it was the quiet ambience, the velvet neon, and the retro decor which was an amalgamation of historic buildings and remnants of 60's counterculture, which had strangely reminded me of downtown Hamilton at night. Expozine is held in the basement of the Eglise Saint-Enfant-Jesus, holding a whopping 250 exhibitors over the course of two days (many vendors -including myself- set up shop the full weekend, but there were a few new faces on the Sunday). There was also room for a lunch counter (which sold beer! in a church! Eat that, Ontario!) Out of tradition at Canzine, I took my roost right in front of the stage, as DJs from a local radio station played a (forgive me) eclectic range of music over the weekend, and unlike Canzine, not at decibels so loud that we have to scream to speak to customers. After returning home and doing a count, I realized I had sold less than I thought. I don't mean this detrimentally, because traffic was constant at this show-- as far as I was concerned, there was seldom time to take breaks- whereas every other fair this year I've usually spent half the day waiting for people to arrive. Customers would customarily buy something and then chat with you for about ten minutes-- no wonder it felt like I sold more, because I was so busy. And despite being six hours from home, I hardly felt like a stranger in a strange land. Familiar faces from Great Worm and Toronto Comic Jam were among those who travelled from the big smoke. Also, ESR was happily received by warm patrons (to my surprise, there was really no other film-related pub at the fair), and I discovered that my French wasn't too rusty (as long as people didn't speak too quickly). Although the fair went to six o'clock both days, I had to cut out an hour early on Sunday, in order to catch the train back to Toronto. It actually hurt to leave, as even one hour prior to closure, there were simply no signs of letup. I had booked a cab to pick me up at 5:15, and I just had enough time to wolf down a sub and hop on the train back to Toronto. On the six hour ride back to the big smoke, I managed to watch three movies on my handy portable DVD player, and remarked to myself that this chunk of time was the most relaxed I had felt in ages, as being away from home or the office thusly didn't make me compelled to be doing a hundred different things. After arriving in the city at midnight, and getting home an hour later, I was still so excited that I couldn't sleep until about three in the morning, and then still had enough of a natural high to wake up (as planned) at six to head to the office for the big day I knew would be happening. I'd gladly do it all over again in '09! At these events, customers and exhibitors alike suffer from sensory overload, as there is simply too much stuff for sale, that we can't take it all in. For that, and for obvious financial reasons, we can only be selective. Because I was so busy, I didn't have a chance to chance and explore like I had hoped, but will report on a couple of interesting finds. I picked up a zine by Warren Hill, where every issue (filled with short stories, poetry and music reviews) comes with a mixed tape of rare 45's revolving around whatever theme surrounds that issue's big record review. But the thing I was perhaps most excited about cost me a whopping two dollars and twenty-five cents in total. 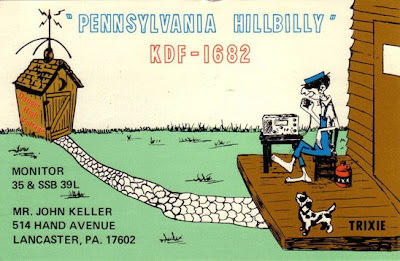 These vintage "citizens band postcards" (seen below) are just the coolest thing, a refreshingly lo-fi artifact from yesteryear. God bless the underground. 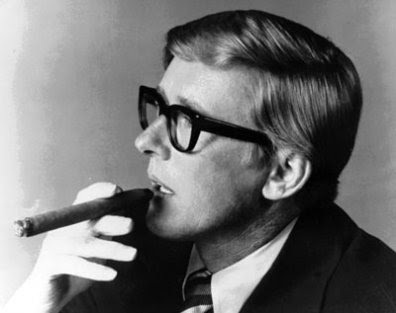 On Wednesday, TV icon Bob Wilkins passed away, after having a long battle with Alzheimer's. 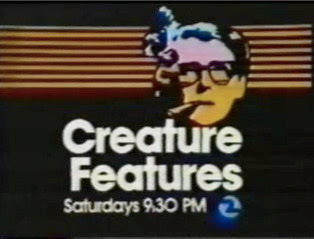 In California throughout the 1970's, his show, "Creature Features" had endeared Bob to many viewers. This beloved horror movie show in the silver age of television featured a host who didn’t dress up as Dracula to introduce the movie, in a set that wasn’t predominately dressed in cobwebs and candelabrum. The original theme music for the show eschewed creepy organ music and instead sounded like something for “Dave Allen At Large”! What is more, the fearless host hated horror films (or at least, his monologues deprecated the movies- "Don't stay up, it's not worth it!"). In the Bay area, Wilkins was an institution, winning the respect of fans and celebrities alike. Despite how he talked about the films he introduced, he gave nothing but admiration and tact in his lengthy and thoughtful interviews (which would usually be featured at the show's halfway mark). 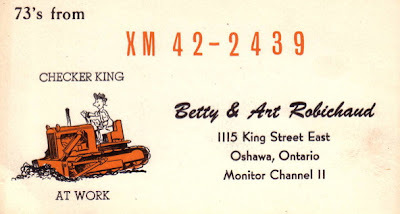 Over the years, collections of Bob Wilkins footage have been made available, where fans young and old can see his entertaining show. Thanks to the advent of DVD, Wilkins has found new fans outside of the broadcast band. Amidst some of the "Creature Features" sequences, one can also find lengthy specials devoted to thoughtful and reverent analyses of "The Twilight Zone" and the "Star Trek" phenomenon of the decade (shot just when the first movie was being rumoured), as well as the hilarious "Monster Movie Quiz" (in an actual game show setting), priceless "Captain Cosmic" sequences, and interviews with such stalwarts as Ben Johnson or Buster Crabbe. All of this stuff is pure gold. And one wonders why some TV producer today with some iota of moxey can't offer up something like this, which keeps the history of the big screen alive on the small screen. 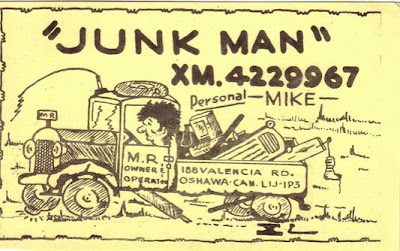 Bob Wilkins was truly an institution, and you owe it to yourself to find this footage. Visit his website for purchasing DVDs and supporting Alzheimer's. Despite not having been on the air for a quarter-century, Bob Wilkins still leaves a long shadow in television coverage of fantasy cinema. Despite what you might gather from the title (perhaps added to capitalize on the catch phrase from the TV show "Alice", which was still hot at the time), this isn't really a freewheeling "good old boy" romp. Made when the cycle of rural exploitation pictures was grinding to a halt, this is a surprisingly dour little epic. Bruce Davison, of all people, has the lead role as a fun-loving screw-up who is being sent back to prison for breaking his parole, but hatches a scheme with his new girlfriend, a brassy blonde (Susan George) who is a kept woman of county tycoon Tony Franciosa, to rob the latter of some money and head to Mexico. 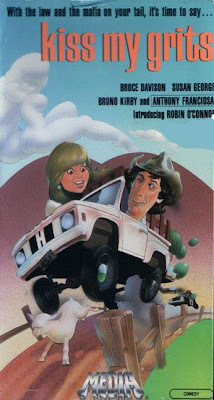 Bruno Kirby has the bizarre supporting role as his slow-witted friend. This would be the final picture made by Jack Starrett (who died in 1989), one of the better action directors of B pictures in the 1970's. But in truth, even his biker revenge flick Run Angel Run has more levity than this morose affair. It is more character-driven than his previous films, and certainly more downbeat than any other "good old boy" movie. One really feels the desperation of these characters, and understands their desire to make a last-ditch attempt at salvaging their lives. Rebecca Balding, the scream queen from Silent Scream and The Boogens steals the film in her one scene as Davison's ex-wife, who does a poor job at raising their son- she is a verbally abusive trailer tramp. (I hadn't realized it was her until I saw the credits.) This screen moment is sad and uncomfortably real. One even sees the helplessness in the smaller characters. Rondo Hatton was a World War 1 veteran who contracted acromegaly, a condition affecting the pituitary gland, thereby causing facial deformity. (It has often been said that exposure to a gas attack during the war was the cause of the affliction.) This former reporter had initially been given bit parts until Universal put him under contract, giving him more substantial roles, obviously exploiting his condition by giving him villanous roles, namely as The Creeper in Pearl of Death and House of Horrors. 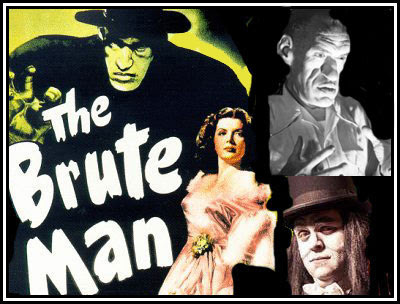 While having read about Hatton over the years, it was only today that I ever saw his notorious cinematic swansong, The Brute Man, once again playing a mysterious killer with the pseudonym of The Creeper, who plots revenge against former college chums who indirectly caused a lab accident which resulted in his disfigurement. After its completion, Hatton had died suddenly from a heart attack, and Universal sold the property to poverty row studio PRC for release. I'm surprised that this wasn't a PRC picture initially, because it looks even cheaper than any of Universal's B-lot features of the time. Despite the familiar structure of detectives investigating the identity of the killer, there is a surprising amount of sentiment, in a subplot where The Creeper befriends a blind woman who teaches piano. But still, this picture was made to capitalize on Hatton's condition, and so the movie is a strange blend of exploitation and melodrama. It is hard to evaluate Hatton's acting ability in this picture, perhaps because the condition had made the ability to make facial expressions difficult. But The Brute Man, clocking in at 58 minutes, is perhaps one of the fastest second features ever made, as veteran director Jean Yarbrough keeps the story moving at a brisk, economic pace. As such, this movie is a lot more enjoyable than it ought to be. Today this movie has an added exploitation value for the appearance of Tom Neal, from Detour (who in real life was later convicted of murder), as one of the heels on The Creeper's hit list.